Click on a Monkee for more information! – Various brass bands and orchestras inc national youth brass band of Great Britain, wrexham symphony orchestra and various one-off stand in posts. – Far too many to list amateur dramatic productions with many different societies around the northwest/wales area. – My trusted Bach Stradivarius trumpet!! Nantwich Jazz and Blues are always mega especially if we play the opening gig on the stage in the square. I’d have to agree with the others in Nakatcha was an amazing gig. Playing on stage at Birmingham ICC was also a gig that hits the right note! Breaking a finger while jumping off stage at the Whitchurch civic hall ……Ouch !! Most irritating time is being cursed by Jackie’s bloody handbag as I’m setting up the pa, lights, instruments etc!! 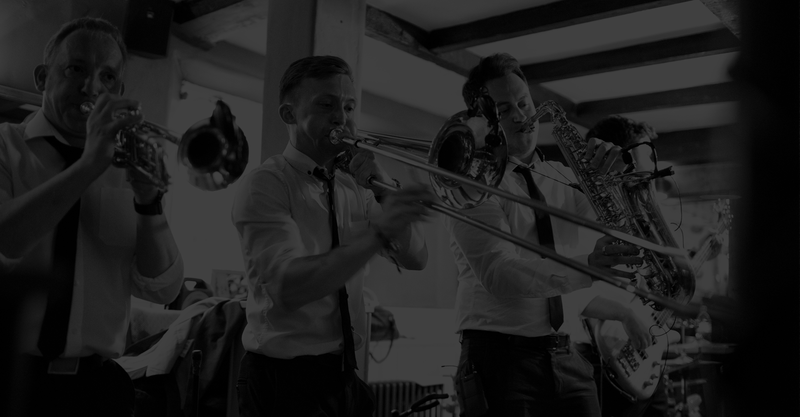 – Dabble in Drums, Keys, Sax or anything brassy! – Hard to say… The Nantwich Jazz ‘n’ Blues are always good gigs. I think I’d have to agree with Steve our guitar man, Nakatcha 2010 was awesome. I was a keen 18 year old at the time, the crowd was jam packed into the venue to the point where nobody could move never mind dance! But man, what a vibe. Blozone, Albright Hussey 2009, Wedding. During the “brass choreography” bit of “Let’s stick Together” (Roxy Music), the table that I was standing on collapsed causing drinks to fly (mostly red wine) all over a brand new white carpet. I ended up with a busted lip and the band was billed £45 for the drinks and broken glass. There was also a booze soaked digital camera to top it all off! The owner wasn’t best pleased and wanted to bill us for the full price of the carpet! Good job our drummer at the time was a lawyer… No more dancing on tables at that venue! Not quite on stage, playing at the Nantwich Jazz and Blues Festival, we were opening the festival on the main stage. Typically I needed the toilet right before starting and ran to the mobile public toilet with an electronic door. After doing my business I went to open a now broken electronic door! Feeling trapped nothing more would do, with no phone I ‘screamed’ for help. A policeman, crow bar and a now accumulated crowd of people cheering I ran to get on stage to a set that had already started! John is an experienced vocalist and frontman, having performed with a number of North West bands covering alternative, rock, soul and classical genres. This includes performing in stage and theatre settings with the Chester based group Soundwall and delivering vocals for pub rock and good all time party band Northern Cross. He’s a dab hand with the tambourine or maracas and does a pretty good job of foot tapping along to the many tunes that fire up the audiences he sings for. He can also deliver an operatic aria that would make your mother shed a tear. His tool of choice is his trusted Heil PR35 Mic which (knock on wood) hasn’t let him down yet. John’s inspirations for singing his soul out with BrassMonkees have to be the soul legends that are Otis Redding, Wilson Pickett and Al Green. True to form his favourite belter and all time party stirrer is Mustang Sally. A big softy at heart, spotting his daughter gazing up at him adoringly in the crowd during his set has to be one of his best moments on stage. – Tamborine (right or left handed – oh yeah) In any key, though not necessarily in the right tempo! Johnny Rocko from Widnes (Ex Factor legend) best seen after 15 pints! – The proudest and most emotional moment on stage was playing at my son’s wedding and the fact he wasn’t embarrassed but it. Priceless. Being asked to stand down and let the bride sing one of my few solo songs at a wedding i’d driven two hours to do. …. fortunately, she was absolutely awful … and I applauded (very smugly) with gusto. I’ve also dep’d for various bands and ‘zero income’ enterprises. – Blozone, Nantwich Jazz ‘n’ Blues, Nakatcha, 2010. The crowd were queuing down the street (way past the Indian Ocean) to get in. Couldn’t hear anything on stage after the first three numbers, the audience were totally into it. Best £20 I’ve ever earned! Fantastic! Hollow Ian Band, Raby Castle, Christmas 1990. Maggot’s Gran (the leader singer… Maggot that is!) had got us this gig for her old folks’ home. The disco, the xmas lights, and all the band (including the pyrotechnics) were all plugged into this single 13 amp wall socket. We shuffled onto the stage after their xmas meal (extra soft sprouts of course) and the first thing Maggot shouts down the microphone, in his most patronising voice, is ‘HAVE YOU HAD A NICE TEEEEEEE?’. This causes the rest of the band to corpse… but worse is to come. Maggot then launches into the intro of the first song…’And a 1,2,3,4,5 o’clock rock’ which sets in motion the obvious car crash in about 3 bars time. It was just possible (through the tears) to see the audience start switching off their hearing aids and start ‘signing’ before the RCD tripped out and plunged the hall into darkness. All true. Polygraph available on request. Convincing the socially awkward Spanish teacher to sing Paradise City by Guns ‘n’ Roses for my friend’s A-level music performance. Could barely hold it together as it was so funny! Headlining Hornsea Music Festival in 2005 and rocking out to Led Zeppelin, Red Hot Chili Peppers and Hendrix to an audience with an average age of about 70. Landing a residence at a bar in Central Durham which provided a free pizza and beers every night we were on. Arriving at a jazz jam night with a terrible cold and fever and having the pianist call the first tune at roughly 700bpm. I had no idea what I was doing! – With Bob on our side..Dylan trib. – No allegiance to any gear manufacturer other than Tama..my cymbals are all dark tones..Zildjian k’s mainly. – Most memorable moment on stage would be difficult due to having very little memory but the ICC gig with Blozone in the early noughties was good. Also playing in Birmingham at St Patricks celebration with U2 band was cool…15000 folks there..so l was told. Freelance keyboard player/singer having played in numerous function bands in London as well as being a solo act in many hotel piano bars and cruise ships. Learned my trade at the tail end of the golden age of cabaret clubs in resident bands at the Lakeside in Frimley and Blazers in Windsor. Always bottom of the bill worked alongside and had to follow many sometimes huge stars. Can name drop for England. Always a big fan of funk and soul with influences that include Sam Cooke, Marvin Gaye and James Brown but have a wide range of different tastes in music.